The wooden Japanese style traditional lodge of the initial building of Showa which has an exclusive open-air bath in the dry river bed of the Oto river.It is a building which feels nostalgia and a tradition for the enough front and wooden floor of a veranda.The stairs where the maple was used for the stretcher board are also an asset.It goes across the bridge for exclusive use applied to the river, and is to the open-air bath of fielder full marks.For an enough reason, it does not care about the public notice on the opposite shore, but can enjoy a hot spring leisurely.A cross-over wind is likely to doze pleasantly the sound of a clear stream, and a surface of a river audible.There is likely to be a Kajika-frog in chirp spring and summer, and a swim in a river is likely to have a "hermit bath" and a starlit sky, and various pleasures in autumn of a firefly and red leaves, and winter.Foundation of the Edo last stage. 2011/7/29 The post-visited again of the Nanki highest peak Oto mountain and the material were chosen, and it was impressed by the creation dish in which the enough device of the originality was carried out with charcoal. A lamber is conserved for years and it builds in early stages of Showa. It is from a guest room at the time of Boys' Festival. Also fresh seafood which went up in the wild grass, river fish, and the Katsuura port which Mr. Itaba takes. * Number of articles and the content change by a Rates. Carpaccio of a tuna and a bream This sauce is a secret. Charcoal noodles Knead the edible charcoal of a micron and be crowded. Meal place: Every morning and evening and room foods.More than 4 persons are the restaurants of a single room. * The effect was said for the whom who of the store which kneads the charcoal of a micron to a side and is crowded to detox as the enough. The man and woman each 1, a wooden bathtub. The feeling of an after-bathing crane crane is a hot spring of an enough lustrous skin system, and free-flowing hot-spring water. Seemingly the hot spring of a faucet is a hot spring and a drink spring will be good for the stomach and intestines. 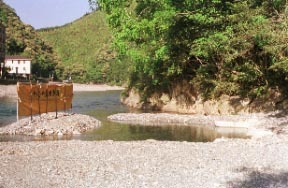 It is "an open-air bath only for a Kameya" to a dry river bed. It has been wells uped by the hot hot spring from a bottom. 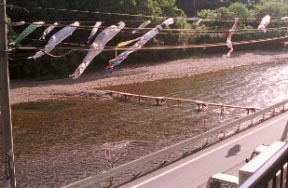 * It cannot be used at the time of rise of water of the river by rain. * A February becomes a "hermit bath" from a winter November. 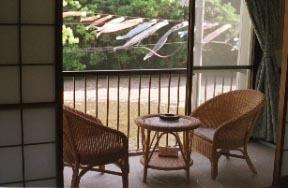 The guest room on which the chair of rattan was placed. "HOTSPOT (those with a LAN card loan)"